A web-based portal that lets administrators configure device settings, create accounts, and buy and distribute apps and books, Business Manager is currently in beta, but Apple says the new platform will launch in earnest in late spring. Seemingly built on existing mass device deployment (MDM) frameworks, the new service integrates features already seen in the Device Enrollment Program (DEP) and the Volume Purchase Program (VPP). The ability to create accounts and manage devices is very similar to Apple School Manager, which first saw light of day in 2016. 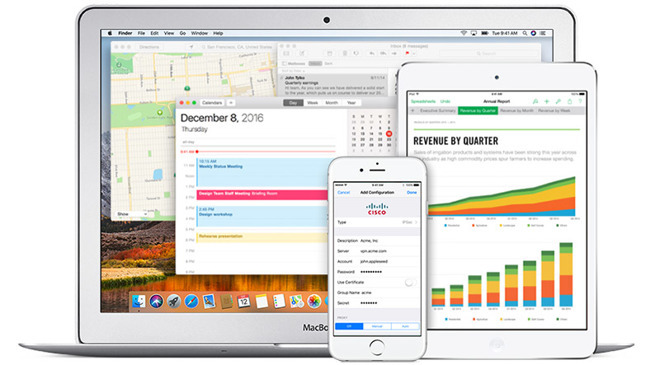 Over the past few years Apple has slowly expanded the availability of its existing DEP and VPP business management programs to additional countries. A web-based portal should bring those tools up to speed with offerings from third-party firms. Apple has been concentrating on a buildout of its business and education verticals recently, with additional education management features announced just last week. Apple started offering MDM for iOS devices back with iOS 7.1. Another recent move to increase Apple's enterprise foothold has been their growing partnership with IBM and the MobileFirst initiative. Apple just recently added new machine learning integrations to the project through Apple's coreML and IBM's Watson. Apple's in-house MDM solution for enterprise has needed improvements for some time, leading third-party solutions like JAMF to flourish. JAMF, which now manages more than 9 million Apple devices, saw record growth last year as Apple pushed further into the enterprise market. Business admins can learn more about Apple's new Business Management platform in a support document published this week (PDF link). Existing users of Apple's DEP and VPP programs looking to try out Business Manager can contact the company to request an account upgrade.